3 Digit IQ is a popular, unique, and high energy band based in Las Vegas. The band performs a wide array of popular songs from current Top 40 Dance Hits to classic rock to retro party music. Led by charismatic lead singer Dayna Collins, the band consists of Las Vegas musicians hand picked from a variety of top national touring and local bands. “3 Digit IQ is our ‘fun band’, the band all of us look forward to each week”, says Dayna. “We love the songs we play, and we are all great friends together. The fun we share on stage goes directly into the show and into the audience, making for a great evening of everyone’s favorite rock and roll”. Performing a wide selection of popular songs, 3 Digit IQ is like your iPod in shuffle mode, great songs; each one you love. Your favorite songs from the fantastic rock and roll songbook performed live by world class musicians. You never know what is coming next, but you know it will be great! The depth of instruments and vocals allows the band to skillfully perform most any song imaginable, flawlessly true to the original together with the excitement of a live concert. In a world of tribute bands, 3 Digit IQ describes themselves as a “Tribute to Party”, always providing a fantastic and unique audience experience. 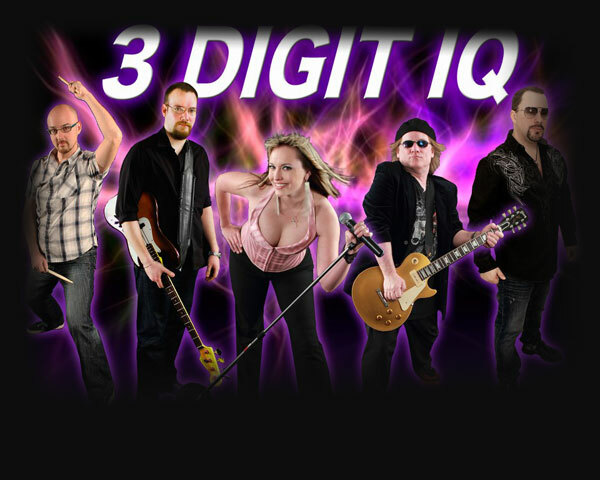 3 Digit IQ has vaulted to success, performing throughout Las Vegas and Southern California, including shows at Bill’s Gamblin’ Hall, the Mirage, the Monte Carlo, The Venetian, The Riviera, the Fremont Street Experience, Cabo Wabo, Tommy Rocker’s and many other venues in Las Vegas, and on the road. Wanna Book 3 Digit IQ? You can book 3 Digit IQ for your next event just by clicking the "Book Them Now" button to the right and filling out the form. We will be in contact with you about their availability as soon as possible.